Why is Cardinal Mahony Voting in the Conclave? A: Douglas is referring to the highly publicized case of the Archbishop Emeritus of Los Angeles, Roger Cardinal Mahony, who is currently in Rome to participate in the conclave, now scheduled to begin on March 12. Unlike the other cardinal-electors, Cardinal Mahony’s presence here has unleashed a storm of criticism from Catholics around the world, who have been insisting that he should recuse himself from voting for the next Pope. 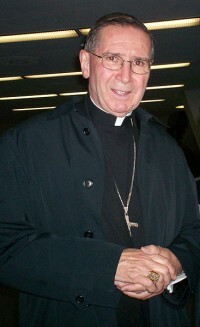 At issue are allegations that during the years when he served as Archbishop of Los Angeles (1985-2011), Mahony repeatedly attempted to cover up cases of clerical sexual abuse of children. Just a few days before Pope Benedict XVI’s resignation took effect on February 28, 2013, the cardinal was required to give a deposition in a California court case, regarding a child-molesting priest who managed to evade arrest by escaping to Mexico, where he remains a fugitive to this day. As can be seen, these events roughly coincided with Pope Benedict’s February 11, 2013 announcement of his resignation. Even though he has been stripped of all duties in the Archdiocese of Los Angeles, Cardinal Mahony is nonetheless legally eligible to vote in the upcoming conclave, because he is still under 80 years of age. (See “Canon Law and the Upcoming Conclave” for more on the eligibility requirements for cardinals to participate.) 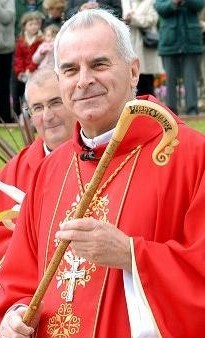 Like many other cardinals, Mahony arrived in Rome before Pope Benedict left office, and he has been here ever since, taking part in the pre-conclave meetings of the College of Cardinals. When it became clear to the Catholic public at large that Cardinal Mahony intended to participate in the upcoming conclave, reaction was both swift and fierce. Thousands of American Catholics signed a petition urging him to remove himself from the voting, while one of Italy’s largest magazines, Famiglia Cristiana, invited Italian readers to voice their opinions about Mahony’s participation—the overwhelming number of which were negative. If in the past, the so-called powers, i.e., States, exerted pressures on the election of the Pope, today there is an attempt to do this through public opinion that is often based on judgments that do not typically capture the spiritual aspect of the moment that the Church is living. So is every cardinal under the age of 80 actually required to participate in the conclave, whether he wants to or not? Is there any legitimate way for a cardinal to recuse himself from taking part in the election of the new Pope? And failing that, is there any way that a cardinal-elector can lawfully be prevented—presumably by his fellow cardinals—from participating in the conclave? The answers to all these questions can be found in Universi Dominici Gregis, the special law governing papal conclaves which was promulgated by Pope John Paul II in 1996. (See “Canon Law and the Upcoming Conclave” and “When Will the Conclave Start? Pope Benedict’s Final Legislative Act” for more detailed discussions of this document.) Note that while Pope Benedict subsequently made some changes to UDG (which are described in the two columns mentioned above), he did not alter in any way its provisions regarding these specific issues, which therefore remain in effect. All the cardinal electors, convoked for the election of the new Pope by the Cardinal Dean… are required, in virtue of holy obedience, to obey the announcement of convocation and to proceed to the place designated for this purpose, unless they are hindered by sickness or by some other grave impediment, which however must be recognized as such by the College of Cardinals. As was discussed in “When Will the Conclave Start?” the Dean of the College of Cardinals, Angelo Sodano, sent a formal letter to every member of the College once the See of Peter officially became vacant. In it he called them to participate in the pre-conclave meetings which began in the Vatican on March 4. This letter constituted the “announcement of convocation” described in this paragraph of UDG. Many cardinals, of course, were in Rome already, either because they work in the Vatican, or because they had already managed to get here in time to bid farewell to Pope Benedict XVI, before his resignation took effect on February 28. These included Cardinal Mahony. But there were a sizeable number of cardinals who were still at home in their own countries, and in some cases it took them a while to settle their affairs and arrange to travel to Rome. The last cardinal-elector to arrive was Jean-Baptiste Pham Minh Man, Archbishop of Ho Chi Min City, Vietnam, who made it here in time for the College of Cardinal’s evening meeting on March 7. There are now 115 cardinal-electors present in Rome for the conclave. There are, however, 117 cardinals who are actually eligible to participate in the election of the next Pope. What happened to the other two? Well, one of them is Julius Darmaatmadja, the retired Archbishop of Jakarta, Indonesia. He notified the College of Cardinals that he would not be travelling to Rome to take part in the conclave due to health problems. Note that in accord with this same paragraph of UDG, these reasons had to be “recognized as such by the College of Cardinals.” In other words, a cardinal-elector could not invent an entirely spurious reason for avoiding his duty to participate—because his brother cardinals could, at least in theory, reject it. That’s why on March 8, at the morning pre-conclave meeting of the College of Cardinals, the College “accepted to recognize” the reasons presented by these two cardinals for their absences. It was an element of pre-conclave procedure that was necessary under UDG. Could Cardinal Mahony, like O’Brien, have cited “some other grave impediment” and excused himself from participation in the conclave, if he had wished? It would appear so. But as we can see, his conscience has instead led him to take part, in accord with the convocation-letter he had received from the Dean of the College of Cardinals. In short, it was his decision to make, and his alone: as the statement from the Secretariat of State (already quoted above) made clear, no cardinal is to be pressured by public opinion into declining to participate in the conclave. Since cardinals aren’t supposed to be hindered from participating by public pressure, it’s only logical that the College of Cardinals can’t prevent any of their eligible members from attending the conclave either. Paragraph 35 of UDG states unequivocally that no cardinal-elector can be excluded from active or passive voice in the election of the Supreme Pontiff, for any reason or pretext. The term “active voice” refers to the right to vote, while “passive voice” refers to the right to be voted for. Therefore, the current conclave law asserts that no cardinal who is eligible to participate can be prevented from voting in the conclave, nor can anyone exclude a cardinal elector from the possibility of being elected Pope. Period. There are ecclesiological reasons for this. Hierarchically, the cardinals who compose the College of Cardinals are all on equal footing. Even the Dean of the College is not the other cardinals’ superior: canon 352.1 states that the Dean has no power of governance over the other cardinals, but rather is to be considered as primus inter pares, or first among equals. He is simply the leader of his peers—not their boss! By now the answer to the question posed by Douglas should be clear. If Cardinal Mahony had wished to bow out of the upcoming papal election, he could have done so, assuming that the rest of the College of Cardinals accepted his rationale. But since he clearly believes that he should take part in the conclave, there is nobody who can stop him. It’s probably very tempting to some Catholics—particularly those from Los Angeles, who object to the way that Cardinal Mahony handled cases of child abuse in the Archdiocese in years gone by—to continue to object to his presence in the conclave, but it won’t make any difference. What will make a difference, however, is our prayers that the Holy Spirit will enlighten all the cardinal-electors to elect as our next Pope the man whom God Himself wants. This entry was posted in Clergy Issues, The Pope and tagged canon law, Cardinal Mahony, Cardinal O'Brien, Catholic, college of cardinals, conclave. Bookmark the permalink.